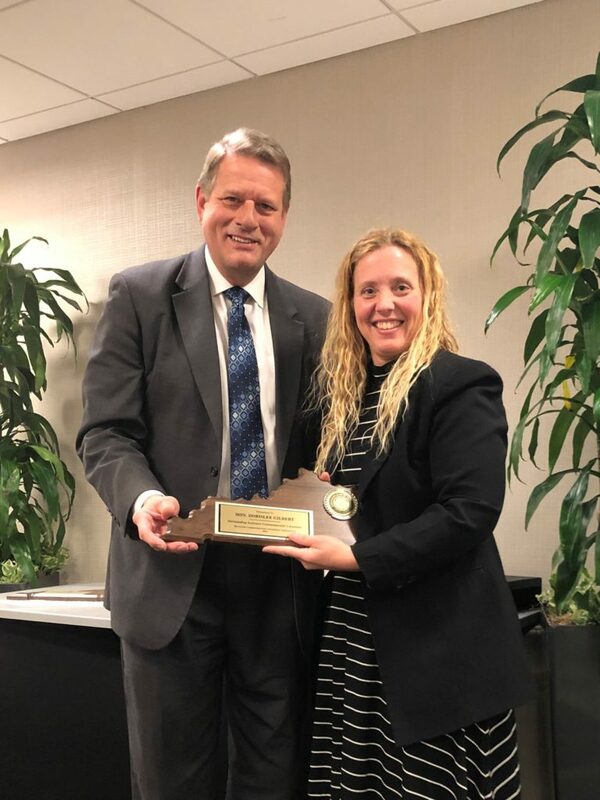 Dorislee Gilbert was one of two assistant Commonwealth’s Attorneys across the state recognized for her outstanding service to the Commonwealth and the Jefferson County Office of the Commonwealth’s Attorney. The award was presented at yesterday’s luncheon during the winter meeting of the Kentucky Prosecutors Conference. Dorislee was hired for our office in 2004 and began prosecuting child abuse cases with DVU. In 2010 she lateraled over to the appellate division where she continues to serve today as the Division Chief. Dorislee has been the portal for many law students who served as clerks and later Assistant Commonwealth’s Attorneys. She still prosecutes cases to keep her trial skills sharp. She has a keen eye for talent, a strong sense of justice, and great trial intuition. She is a great appellate attorney because she has walked the talk! 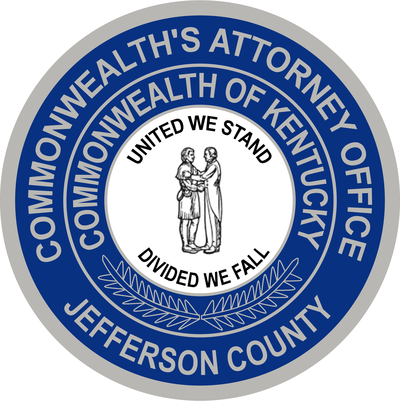 Her “did you know” series and her in house trainings match any courses offered by the National District Attorneys Association and the Kentucky Prosecutors annual conferences. She is a true asset to all Kentucky prosecutors and is our treasure. Thanks Dorislee for all you do! Mr. Goff (DOB 09/24/95) is charged in connection with the armed robbery of a Game Stop located on Raggard Road on June 8, 2016. After a female co-defendant entered Game Stop in order to scout it for the Robbery, Goff and a juvenile co-defendant then entered the store. They were hooded and wore bandanas. The juvenile pointed a loaded handgun at the clerk, and both robbers immediately shouted demands for the business cash. Goff jumped over the counter and filled his backpack with business cash from the registers. The store clerks cooperated fully with their demands. Nevertheless, both clerks were struck in the head with the pistol and injured. The victims were transported by EMS to the hospital emergency room for treatment of head wounds. The defendant fled with his complicitors and around $1,200.00 in business cash. A Jury Trial began on February 12, 2019 and on February 14, the Jury convicted the defendant of both counts of Robbery in the First Degree after only ten minutes of deliberation. The Jury recommended a sentence of 10 years in prison for his crimes. Critt Cunningham and Jennifer Bell are the prosecutors. Mr. Curry (DOB 01/25/88) was charged with the August 5, 2017 shooting of James Harris while Mr. Curry was out on bond on the Home Incarceration Program (HIP). Mr. Harris died as a result of his injuries. Mr. Harris had been allowing Mr. Curry to do HIP at his home and Mr. Curry asked an acquaintance to bring him a handgun earlier that day. A Jury Trial began on February 11, 2019 and on February 15, the Jury convicted the defendant of all charged crimes and recommended a sentence of Life in Prison. Final Sentencing is scheduled for April 22, 2019 at 12:00 p.m. in Division 3 of Jefferson Circuit Court. Emily Lantz and Milja Zgonjanin are the prosecutors. Mr. Hurt (DOB 10/06/00) is charged with the November 9, 2016, murder of his romantic partner Trayona McDowell (DOB 10/17/98) on Egypt Lane. A final Pretrial Conference is scheduled for February 18, 2019 at 11:00 a.m. in Division 12 of Jefferson Circuit Court and a Jury Trial is scheduled to begin on Tuesday, February 19 at 10:00 a.m., also in Division 12. Elizabeth Jones Brown is the prosecutor. Mr. Willis (DOB 09/10/64) is charged with the July 12, 2016, shooting death of Ashley Springgs at 2323 W. Muhammad Ali Boulevard. A Jury Trial is ongoing in Division 6 of Jefferson Circuit Court. Kaleb Noblett is the prosecutor.